So, this months theme was super hard for me. We all agreed to the themes back when we started this collab paper doll project, but I’ll confess that I really really struggled with this one. I just don’t draw a lot of occupations paper dolls. So, my first idea was to do like a Fire Fighter, but that would have taken a lot of research. So, would have that the other ideas that I had. Finally, in the interest of not doing research, I decided to draw what I know. 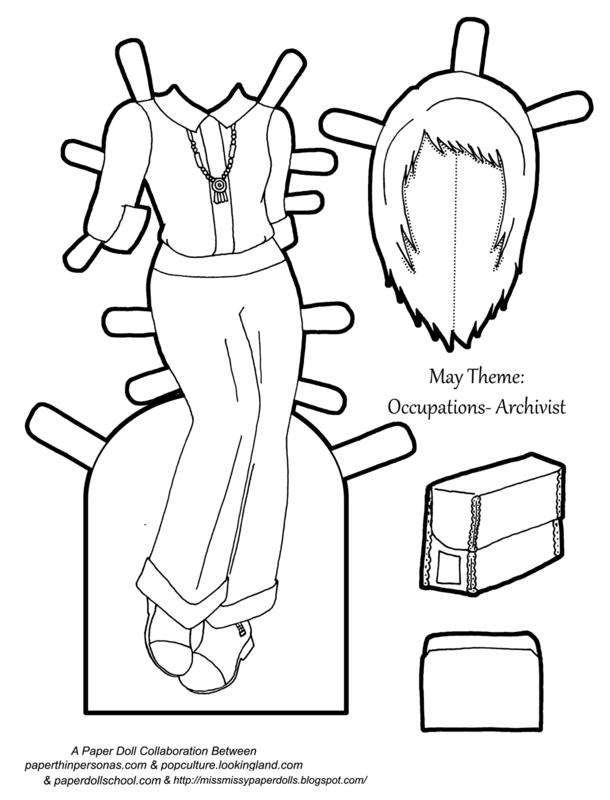 Therefore, I am pleased to present a paper doll Archivist. Why an Archivist? Because I am one. See, super simple? But wait, you maybe thinking, I thought you were a librarian! Actually, I am both. After drawing an outfit, I decided that she needed a classic Archivist accessory and what could be more fitting than the ubiquitous to archives Hollinger Metal edge document case? One thing I was NOT going to do was give her a bun, so I went with a casual long layered style. I though I always keep my hair in a ponytail at work to both keep it out of my face and out of my collections. So, check out Popculture and Paper Dolls, Miss. Missy and Paper Doll School for three other occupation inspired paper doll outfits. Totally love this! It’s professional, classy, and fashionable (as well as practical). Archivist is probably my non-art dream job. Collecting, cataloging, and storing my family history is probably the closest I’ll ever get to actual archiving!